If you like to draw things in a non-traditional way, then this is the kit for you. The creators of this splendid novelty set provide their audience with a packet containing four special markers and an eraser. Then there is the book which is made up of pages of photographs which you can color on. At the bottom of every page the editors provide suggestions of things that you can draw, if you need a little help to get started. Then, when you have finished your masterpiece you can wipe the page clean and start the process all over again. It is interesting to see what you can do to the photographs to make them look completely different. A stone can be made to look like a bug or a crab. A seashell can be turned into a peacock or a flower. A photograph of a square cracker can be drawn on to create a present, a computer monitor, or a house. In all there are eighteen photograph pages to color on. In addition to the photographs of the stone, the seashell, and the cracker, there are, among other things, photographs of a leaf, a cloud, a lemon, and a sock. This ingeniously simple set will give art-loving children hours of fun, and it is compact enough that it can be carried in a car, on a plane, or to a friend's house. 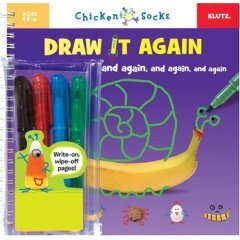 It would make a perfect gift for any child who loves to draw.